If you are a student researching for your project, a researcher conducting literature review for your thesis, a teacher preparing notes for your lectures, a speaker noting down a passage or quotation for your speech, or a writer researching for your new book, then this product is ideal for you. I am sure all of you have encountered situations where you have to write down a few passages or sentences from a book, journal, or other print references. Writing down a few paragraph or a few sentences from large reference books or journals is a time consuming and strenuous task. Now you have an alternative—IRISPen Scanner. 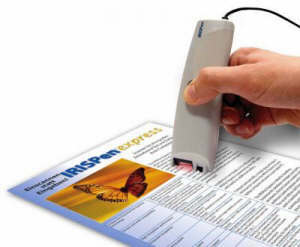 IRIS pen scanners are available in different versions. The product reviewed here is IRISPen Executive. 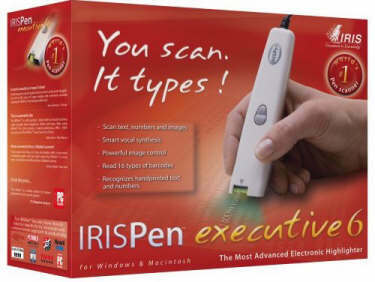 The IRISPen TM Executive is the full-featured OCR scanning pen. This scanning pen works just like a highlighter—simply slide it over printed information from newspapers, magazines, faxes, letters, etc. What you get is real and editable text, right at your cursor. The scanner recognizes more than 50 languages. IRISPen Executive connects to your computer via a USB port. It takes a few hours to master the scanning process. But once you get the hang of it, near 100% accurate scanning is possible. I have a reasonable typing speed of 60wpm, but when I tried scanning the text instead of typing it took only about one-third the typing time, which is considerable productivity improvement. The scanning is faster and most accurate when you are scanning from plain sheets or books that lay flat on the table. Getting perfect results using books that does not fully open or have a curved profile require some practice. The scanner is attached to the computer using a USB cable which restricts the free movement of the scanner. IRIS could have used a more flexible cable to make things easier. This pen scanner scans text (font sizes from 8–20 points), dot matrix printer outputs, barcodes, small images, and so on. There is also a speech synthesis with which you can make the IRISPen speak out the recognized data for you. The speech synthesis is available in seven languages— Brazilian (Portuguese), British English, Dutch, English, French, German, Italian, Russian. Speech synthesis is easy; just scan the text and the computer reads it out. But enabling speech synthesis will reduce the scanning speed considerably. Since the scanner is connected to the USB port using a cable, there is no need for external power supply. This is an ideal tool for anyone who wants to capture text into their computers. The scanner is an ideal companion for your laptop when you go to the library for research as you could scan in the text you want directly into your word processor much faster than typing. There are a few things that IRIS could have done to improve the user experience. First as I have mentioned above the USB cord could have been more flexible. Second, a pen stand (see Figure 3) or an end cap (see Figure 4) for keeping the scanner would have been ideal for protecting the scanning head when it is not in use. 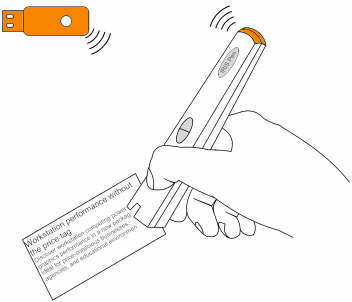 Another option could have been to make the scanner wireless with a USB Bluetooth transceiver (see Figure 5) or store the text in the scanner (like a pen drive), which could be transferred to the computer when the scanning is finished (see Figure 6). One of the reasons IRIS went along with the corded USB option was accuracy, in that case, the only suggestion I have is to make the cord more flexible. 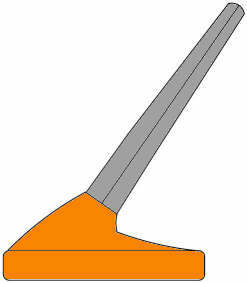 An excellent product that is very useful for all who deal with information. More information about IRISPen products is available at IRIS Web site. Nice review. I was looking for such a product. But there are other similar products by companies like Wizcom, C-Technologies, etc. Do you think IRIS is better than the products offered by other vendors.